Jiva Goswami took birth as the son of Sri Vallabha. When he was only a very small child his father and uncles were the chief ministers of the entire kingdom of Bengal. Their headquarters was in Ramakeli in the Malda district of Bengal, close to the Bihar border. Srila Sanatana and Sri Vallabha, they wrote many letters to Sri Chaitanya Mahaprabhu, begging him for mercy, because they were sick and tired of being engaged in all these worldly activities under the jurisdiction of a very cruel and hateful chief. In response to their appeal, Sri Chaitanya Mahaprabhu came to Ramkeli. When he (Sri Chaitanya Mahaprabhu) came dancing in the town, chanting the holy names, there were literally millions of people following him. During that visit, once, in the late of night, Rupa, Sanatan and Sri Vallabha decided that they wanted to meet Lord Chaitanya. So they disguised themselves, incognito, in the middle of the night. There they met Lord Chaitanya, Lord Nityananda and Haridas Takur. Meanwhile, little little Jiva followed from behind. And from a little distance away he watched and heard everything that took place. His father and uncles left; they went to Vrindavan to meet Lord Chaitanya. But on one trip, very soon after, back to Puri, Jiva Goswami’s father Sri Vallabha, who Lord Chaitanya named Anupam, disappeared from this world on the bank of the Ganges. When little Jiva heard this, how much he was aggrieved in his heart at the separation from such a great devotee in the form of his own father! He wept, he cried, he rolled in the ground. It is said that anyone who heard his crying, their hearts would shatter into hundreds and thousands of pieces. Some of us are middle aged or even growing old, and we are still thinking, “When I get much older, then I will not waste a second! Now there are so many materialistic desires in my mind to fulfill.” But Jiva was only a tiny child hardly four years old, but he would never hear or speak anything if it was not the glorification of Krishna and the chanting of Krishna’s holy names, Hare Krishna Hare Krishna Krishna Krishna Hare Hare, Hare Rama Hare Rama Rama Rama Hare Hare. He would play with his friends; he would not engage himself in any play unless it was directly related to Krishna’s pastimes. He had little deities of Krishna and Balaram. Those deities were his life and soul. In fact, it is said that he made those deities with his own hands. He would offer flowers to the deities, he would offer chandan to the deities, and he would offer food to the deities – delicious foods. He would decorate them with clothing and ornaments, he would sing for them, he would dance for them, and he would gaze upon them sometimes for hours and hours at a time with unblinking eyes. Those deities day and night could never be separated from him. When he would go to sleep, he would clutch the deities and embrace them to his heart and sleep every night. One evening, just at the time of sunset, an overwhelming separation came to the heart of little Jiva. He called out, “Oh Lord Sri Chaitanya Mahaprabhu! You are the deliverer of the most fallen. Where are you? Oh Lord Nityananda prabhu! Oh Advaita Chandra! You have descended into this world to deliver the most fallen; I am the most wretched; I am the most unfortunate; please, please have mercy on me!” In this way he cried all night long, crying out for the names of the Lord. He could not sleep, but just towards the end of the night, by the divine arrangement of Sri Krishna, he fell asleep. As he fell asleep, he had a dream. Suddenly, the dream broke. Jiva Goswami woke up weeping and crying, “Where has my Lord gone?” After he was crying for some time, by the Lord’s desire, he fell asleep again. This time Krishna and Balaram appeared before him, his own personal worship-able deities! Krishna was blackish like a monsoon cloud; he had a three-fold bending form and his hair was decorated with a feather of peacock. Balaram had the complexion of a beautiful white spring cloud; he had blue garments, beautiful lotus-like eyes. The two brothers stood before him smiling, more enchanting, more beautiful than anything other this world has ever seen. Jiva fell down at their lotus feet and surrendered. 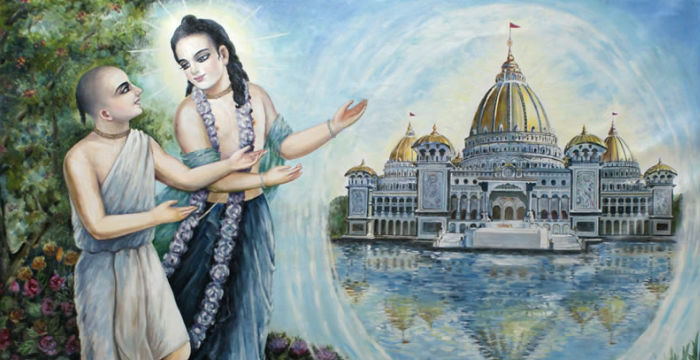 At that moment, Lord Balaram transformed into the beautiful form of Sri Nityananda Prabhu and Krishna transformed into the form of Sri Chaitanya Mahaprabhu. Their beautiful golden complexions splendid more than radiant gold, they cast their merciful loving glances on this merciful child. He fell and surrendered at their feet. Lord Chaitanya and Lord Nityananda both placed their lotus feet on top of his head. Lord Chaitanya offered him to the feet of Lord Nityananda Prabhu and Nityananda Prabhu gave him the shelter of Lord Chaitanya’s lotus feet. They spoke sweet charming words in his ears again and again; the two brothers embraced him; but that dream broke. When Jiva Goswami woke, it was dawn, the sun was rising. It was then and there that he made his vow to go to Navadweep. Throughout his childhood he was not interested in anything material. Because he was born in a family of royalty, he was given beautiful garments, precious ornaments, very soft wonderful beds and the most delicious foodstuffs; but he didn’t care for any of it. He simply wanted to follow in the footsteps of his uncles, Rupa and Sanatan, and entered into the renounced order of life. He contrived by certain means to somehow or the other get permission by which he and one servant went to Navadweep Dham. That morning Lord Nityananda Prabhu told Srivasa, “Today Jiva is going to come, the nephew of Rupa and Sanatan Goswamis.” The messenger came to Nityananda Prabhu and told him that Jiva was at the door. Nityananda Prabhu immediately… “Send him in.” It was in the house of Srivasa Takur. When Jiva Goswami first met Sri Nityananda Prabhu, he offered his obeisance at Nityananda Prabhu’s lotus feet, who placed his feet on his head. Previously he did it in a dream, but now he was doing it in person. He picked up and embraced little Jiva again and again. He became so very dear to the heart of Srivasa Takur and all the other devotees. Nityananda Prabhu, to show him his infinite affection, he personally took Jiva Goswami on a tour of all the nine islands of Navadweep. This is described in great detail in Narahari Chakravarthi’s Bhakti Ratnakar, and also in Srila Bakthivinod Takur’s Navadweep Mahatmayam. From Srivasa Angan they went to Yogapeeth, the birthplace of Lord Chaitanya. There Sachi Devi and Vishnupriya, personally with their own hands, cooked a wonderful feast for Jiva Goswami. Vamsi Vadana, the personal assistant of Lord Chaitanya, who became the personal servant of Vishnupriya, he showered his blessings and even accompanied them on their parikrama for some time. When they came back to Srivas Angan, Nityananda Prabhu told Jiva Goswami, “You should go to Vrindavan, because now Gauranga Mahaprabhu has personally given Vrindavan as a home to your family. 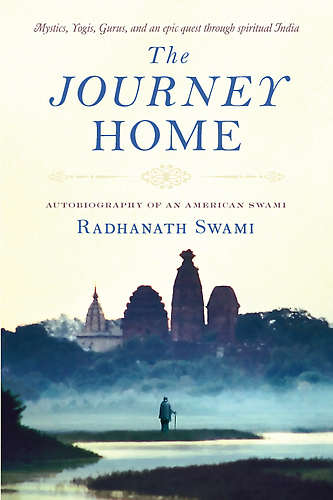 You go home, but on the way stop in Varanasi and you study the shastras under Madhusudan Vachaspathi.” Jiva Goswami, following that instruction, went to Kashi or Varanasi. Madhusudan Vachaspathi was the greatest scholar of that time in Kashi. Jiva Goswami was his topmost student. He studied Vedantas, he studied Upanishads, he studied Puranas, he studied Nyaya philosophy of logic and superseded in every subject matter. Madhusudan Vachaspathy, who was a personal associate of Vasudeva Sarvabhauma Battcharya, he was glorifying his student wherever he went. When he was twenty years old, Jiva Goswami entered into Vrindavan. There, he was joyously welcomed by Srila Sanatan Goswami, Srila Rupa Goswami, Raghunath Bhata Goswami, Raghunatha Dasa Goswami, Gopal Bhata Goswami, Lokanatha Goswami, Bhugarbha Goswami, Kashiswara Pandit and so many other devotees. Jiva Goswami became so very, very dear to all of them. Jiva Goswami approached his eldest uncle Sanatan Goswami for initiation. 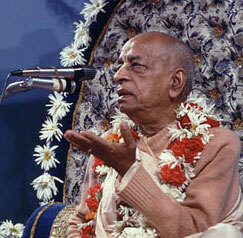 Sanatan Goswami, out of great humility, offered him to Srila Rupa Goswami. In obedience to Srila Sanatan Goswami’s desire, Rupa Goswami willingly accepted him as his disciple. However, before giving him initiation, he wanted to give him proper training. He engaged him in the most menial types of services. That is a Vaisnava: to be humble as a straw on a street, more tolerant than a tree, to be eager to offer all respects to others, and to expect none in return. In this consciousness we can all chant the holy names of Krishna. Hare Krishna Hare Krishna Krishna Krishna Hare Hare, Hare Rama Hare Rama Rama Rama Hare Hare. “Ah! What are you saying? My guru has been defeated by a puffed up wretch like you!” He looked at the certificate by Rupa Goswami in his own beautiful handwriting which was like rows of pearls. He understood that his Guru Maharaj did this only out of their humility but this man was going to misuse their humility to blaspheme them. He said, “Alright, I accept your challenge.” He sat on the bank of Jamuna for many days and in the end Jiva Goswami conquered over Rupa Narayan. He was so humiliated; he was defeated by such a young person. He was irrefutably slaughtered in this debate. He left Vrindavan never to be returned. He went to Mathura for approximately one year. He performed severe tapasya, fasting, praying, weeping, crying, and trying to atone for his false ego. It was at that time Srila Sanatan Goswami came to Mathura and found him. He returned to Vrindavan. Sanatan Goswami was Rupa Goswami’s guru. He said “Rupa Goswami, you are not attentive to the teachings of Sri Chaitanya Mahaprabhu.” Now if someone said that to you and me, we would say, “What you mean! How can you… dare you say that to me!” Rupa Goswami said, “Oh! Please, please tell me how I can improve. How am I deviating? Please enlighten me.” Sanatan Goswami said, “Oh Rupa! Please tell me what the cardinal principles of Lord Chaitanya are.” So he (Rupa) named chanting of the holy names, service to the Vaisnavas – Vaisnav seva – and then he mentioned compassion to the living beings – Jivedoy. When he said Jivedoy, Sanatan Goswami acknowledged, and Rupa Goswami understood – I am not properly compassionate to Jiva. So he called him back. Another occasion like this took place. 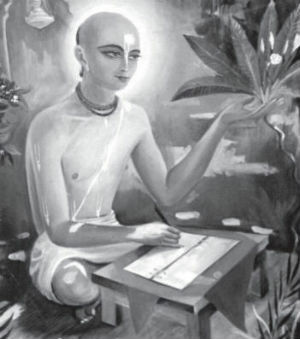 Rupa Goswami was writing his Bhakti Rasamrita Sindhu. When the very senior great Vaisnava Vallabha Bhattacharya came to visit them, he asked to see Rupa Goswami’s work and Vallabha Bhattacharya said, “I see some grammatical mistakes here.” Rupa Goswami said, “Oh! You do very good. Please take the manuscript and correct it in any way you like.” So he took the manuscript, he went to the Jamuna to bathe, and there was Jiva Goswami. He said, “Your Guru Maharaj gave his manuscript to correct.” Jiva Goswami, with great humility, said, “To correct? Rupa Goswami doesn’t make mistakes! Please, can you tell me what mistake?” Vallabha Bhattacharya explained and Jiva goswami described with such incredible precise philosophical conviction how what he (Rupa) said was perfectly right. Vallabha Bhat was astounded – what kind of scholar is this! “Rupa Goswami is right. You are right.” He went back to Rupa Goswami and said, “I’m sorry and should never have taken your manuscript. Everything you say is perfect.” Rupa Goswami said, “What are you talking about? I thought you were going to edit my work!” He said “No, no, no. Your disciple Jiva explained it to me. It is perfect.” Rupa Goswami called Jiva Goswami and said, “He is a senior Vaisnav; he is senior to you, he is senior to me; he wanted to do some service and you are correcting him?! This kind of false pride is not tolerated in Vrindavan. You must get out.” So again he left to Vrindavan. This time he went to Nanda Ghat on the bank of Jamuna in a very secluded place. That is the place where Nanda Maharaj was arrested by Varuna. He was in a very terrible state of health. Sanatan Goswami brought him back to Vrindavan and Rupa Goswami, seeing the sincereity and the humility of his disciple, personally nursed him back to health with his own hands. One day Jiva Goswami called all the saints of Vrindavan to Radha Govinda temple and announced, “On the fifth day of the bright moon of the month of November-December I am going to be sending these three personalities to distribute the Goswamis’ books, and from their efforts these books will be distributed all over the world.” He sent Srinivasa Takur, Narottamdas Takur and Shyamananda to visit all the great devotees in different places to get their blessings. And they came and had another meeting in the Radha Govinda temple. Jiva Goswami and the devotees prayed to the deity of Govindaji – “Please empower Srinivas; please empower that their mission will be a success.” As they were praying, the garland of the deity came off his neck and Jiva Goswami placed it on Srinivasa Acarya. There was a procession to Mathura on bullock carts which carried the books, and Jiva Goswami embracing again and again Srinivas Acarya and Narottamdas Takur and Syamananda Prabhu, sent them to Bengal. The oceanic topics of Jiva Goswami are unlimited. But small persons as ourselves, what can we say? For the purification of our hearts, it is our great fortune to try to share something about the attributes of our divine spiritual forefathers such as Srila Jiva Goswami.